Plumbing Connection takes a look at what is currently making news in the ever changing hot water sector. Rinnai have extensive, high quality and reliable gas and electric storage tanks, designed as quick and easy replacements for existing systems. The Rinnai Hotflo range of 4 Star Gas Storage Hot Water Systems offers your customers a choice of 135 or 170L storage capacities and delivers mains pressure hot water to multiple taps at once. The tanks are for external installation only and are thermostatically controlled with safety temperature shut-off for peace of mind. The vitreous enamel lined steel tank offers a 4 star energy rating, inbuilt anode protection and a pressure temperature relief valve. A hard water anode variant is also available. Rinnai provide an 8 year cylinder warranty on both gas models. Rinnai Electric Storage Hot Water Systems come in a wide range of element sizes and capacities, from a compact 25L, through to a large 400L storage cylinder. These internal or external units are designed to suit the changing water usage needs of Australian families. The tanks are dual handed; providing flexible installation and the standard sizing is perfect for an emergency changeover. Rinnai can provide single or twin element configurations and have a complete range of elements and anodes available. There is also a 7 year cylinder warranty on all electric models. STIEBEL ELTRON prides itself on its long history of innovative water heating products. For 90 years, STIEBEL ELTRON has developed high quality water heating products that offer greater convenience and comfort. 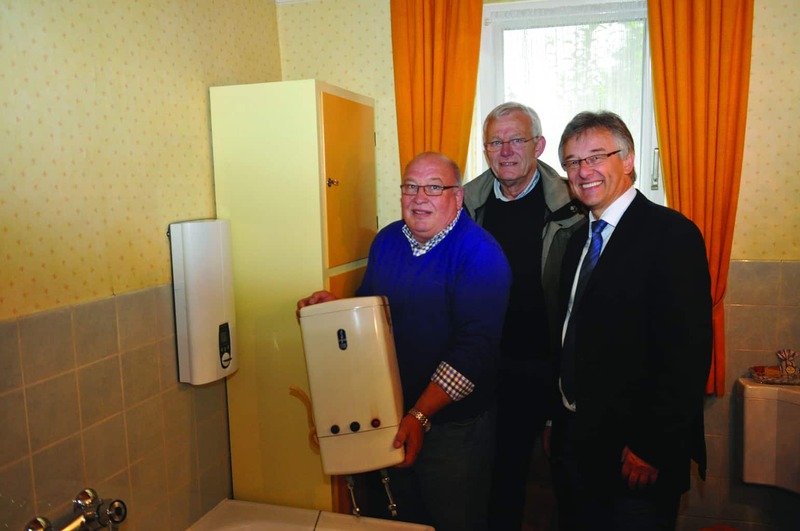 Perhaps the thermally controlled DH 18 water heater installed at the Kleinesdar home in Bielefeld Germany is one of the best examples of the high quality standards at STIEBEL ELTRON. Production of the STIEBEL ELTRON DH 18 instant water heater began in 1949. Wilhelm Kleinesdar had the DH 18 installed in the basement to service his bathroom. Remarkably he still had the original purchase receipt dated 30 September 1958. Wilhelm Kleinesdar’s water heater operated flawlessly for 56 years. “Without repair,” said Kleinesdar, despite the very high lime content in the water. With the invention of the fully electronic instantaneous electric water heater models in 1987, the thermally controlled style water heaters gradually disappeared from the market. Wilhelm’s faithful DH 18 was put into retirement and is now on its way to take its place in the STIEBEL ELTRON museum. The all-new STIEBEL ELTRON DEL instantaneous 3-phase electric water heater now takes its place on the wall in the Kleinesdar home. In 2013, Bosch introduced the Bosch Compress 3000 hot water heat pump into the Australian and New Zealand markets. Living up to their strong commitment to delivering the best products possible to their customers, Bosch has further improved this heat pump and has now launched a Gen 2 version. This new model is capable of extracting energy from the air even in negative temperatures, with the heat pump module operating from -7°C up to 40°C, and transferring the energy into the hot water storage tank. Built with the best components, the Bosch Compress 3000 Gen 2 will guarantee hot water comfort throughout the year, no matter where your customers are situated in the country. Another benefit of the Bosch Compress 3000 is that it reduces energy consumption by up to 65% compared to an electric storage system. To make the initial investment easier for your customer, the Compress 3000 is also eligible for generous government incentives. With this product being designed and manufactured in Europe, one can expect impeccable quality and high reliability. All heat pumps components are rigorously tested during the development process undergoing life-time tests equivalent to 15 years of usage. The new Bosch heat pump is a well-thought through hot water system that is a great alternative to an electric storage system or an electric solar hot water system as it does not require solar collectors on the roof, making the installation easier and up-front investment less costly for your customers.